So my mare (who is set to run prelim events in 5-6 weeks time) has decided she would like to go btv. She’s always been strong, I can hardly manage her on the flat in a snaffle indoors, let alone outdoors. Her previous owner never worked her outside unless they were showing, creating a huge stigma around outside. She has a fair bit of nerve damage to her tongue, and when I pull too much she gets very heavy in the bridle. Recently she’s been extremely hot, so I shorten my reins like any unknowing rider would. She ended up being extremely unbalanced, heavy, hot, crooked and btv after a few minutes. This was inside. I’ve tried long rein trotting in attempt to get her nose poking out but that was no good and made the problem worse. We ended up running around at a very fast and unbalanced trot, occasionally breaking into a downhill canter. She leans quite severely against side reins, hence why mine are stretched out. Any suggestions to help fix my hot, on the forehand, btv horse? I don't know what btv means... bit to violence?? It sounds very much like your horse needs some good training, has just been forced & hung onto with the bit instead of being *taught* to *yield* to it. Sounds like she's new to you? I would actually forget events & such for now, and work on getting to know her & training her to respond to you well first. But first & foremost, I'd want to be thorough about ruling out/treating any pain/discomfort that may be a big part of the probs. That she's always been 'strong' means that she's resisting the bit, not responding to it. If she's a lot better indoors, that's where I'd start, and I'd get her going well on the ground first before riding. I'd also get her going well at a walk, before attempting trotting, etc. She has a fair bit of nerve damage to her tongue, and when I pull too much she gets very heavy in the bridle. Recently she’s been extremely hot, so I shorten my reins like any unknowing rider would. If she has nerve damage to her tongue(what from?? ), it's hurting her, I would NOT be riding her in a bit. I would ABSOLUTELY not be putting any significant pressure on the bit. There's one pain factor you may be able to address easily. Not sure I get why you shortened your reins or pull 'too much' if it sounds like you know better. Are you a learner? If so, as it sounds like she's a 'difficult' horse because of past treatment, I'd consider finding a good rider/trainer to work with her, rather than you doing so. She may be 'extremely hot' lately due to too much feed, not enough exercise, etc. But I suspect she's 'hot' with frustration at not being able to work out how to get out of her pain. I’ve tried long rein trotting in attempt to get her nose poking out but that was no good and made the problem worse. Yeah, sounds like she is not able to relax under saddle. You need to address her *attitude* about being ridden not just her nose Obviously if she's hurting/worried about hurting, you need to deal with that first & ensure it never happens, for her to learn she doesn't need to stress about it. Unfortunately it depends how 'ingrained' that attitude is as to how hard/easy it will be to 'fix' even when the pain is gone. If she associates the bit with anxiety because of tongue pain, then going bitless will help avoid the previous associations too. As said above, I'd start at a walk, not trot - maybe even at a standstill if she's anxious there too - and teach her to *relax* at each pace, before asking anything else at all. Then you can work gradually forward to whatever goals, but be able to fall back to a Good Place if you find you've gone too fast for her & she's getting antsy. mslady254 and Jolly101 like this. loosie, phantomhorse13 and Foxhunter like this. You need to find ways to moderate her speed that don't involved pulling back on both reins. Try opening your inside rein and circling her down until she slows, then let her go straight as her reward. I posted this video recently in another thread, but it's good advice!! loosie, bsms, Foxhunter and 3 others like this. The whole 'btv and still going strong' is something that tends to mostly happen when horses are ridden in a bit that's too harsh/strong and worked in something that's designed to force and hold the horse in a 'headset'. When they can't evade the uncomfortable pressure by sticking their head in the air they learn to evade it by going btv instead. I've bought horses that would have their chins on their chests and still be taking off at a gallop. Adding anything that's going to create more pressure/more discomfort is a waste of time. You're better off going for the mildest bit you can find. I found the Happy Mouth Shaped Mullen mouth bit worked about the best. Bits that work like the Dutch gag can help because they take the pressure away from the bars and upwards into the corners of the mouth but if they aren't legal for whatever you're competing in they only work as a training aid. Another thing that can work as a training aid is kineton noseband or even a mechanical hackamore - but only if the horse hasn't already figured how to evade pressure on the nose. I'd also go back to lunge work and teach verbal cues to use as before the body/hand cues when riding. bsms, Foxhunter and Caledonian like this. I have a horse with a very sensitive mouth and brain, who is also very forward and excitable. If you put too much inescapable pressure on him in any way, including with the bit, he will explosively rodeo buck -- like heels over head, twisting, snorting, straight-legged jumping, December in Las Vegas bucking (as opposed to a few little crow hops or straight leg hops, just to be clear). I have found excellent results with the Myler Combination bit. I use the mildest correctional mouthpiece (he's Western trained and seems to prefer a broken mouthpiece), but you can choose a comfort snaffle if your horse has mouth pain. They sound gimmicky, but mine has worked miracles with Salty. The premise of the Myler combination is that initial, light pressure is primarily communicated through the mouthpiece, but as pressure increases, it is spread equally over the tongue, bars, poll, nose and curb/chin. With Salty, who is a big, strong, agile QH, I have to walk a thin line between not putting too much pressure on him mentally or physically, but needing the confidence that I can shut him down or redirect him if he temporarily loses his head, which can happen with excitement, frustration, fear (past harsh training), or discomfort. I have been able to successfully shut Salty down in two situations where he loaded up to blow and buck, in one big spook and spin, and he has not been out of control since I started using it last summer. If I keep my hands quiet but firm and keep my seat deep and following, he is able to regain his composure and come back to me in a split second when he loses his executive functioning for a moment. I do agree with other previous comments that this horse is not ready to compete, especially if she can't even tolerate being ridden outside. The biggest change in Salty has come from dialing things wayyyyy back. Initially only walking, releasing pressure when he was relaxed, long and low, and slowly adding in trotting and loping. Our progress has been much more the result of building trust and reducing fear and anxiety for both of us. There isn't a bit in the world that will let you accomplish your goals without addressing the mental and emotional issues, too. bsms, phantomhorse13, ClearDonkey and 1 others like this. Last edited by Cedar & Salty; 04-14-2019 at 12:41 PM. 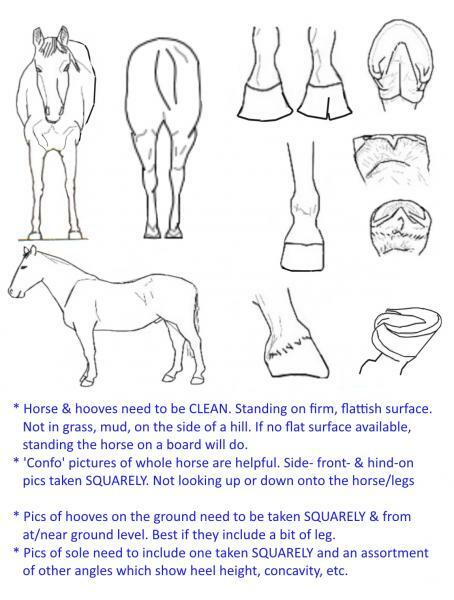 In my experience, this is not an issue that has a quick fix and can take quite a long time to re-train out of the horse. You're dealing with both a psychological issue (fear of the bit) and a physical one where the horse has now developed muscle that counter acts against travelling properly on the bit. First, I have to ask if her teeth are up to date?
. This is done until the horse is reaching forward to the bit on their own. Then, you can modify this exercise for undersaddle. Start at the walk and only ask for a few strides of trot when she is showing that she understands how to move up into the bit. . You can add in lateral work and halt/walk transitions etc. I'd also keep these sessions short if possible and reward small improvements. I also agree with Loosie that you should try bitless or a mild bit. loosie and UnhappyHacker like this. Oh duh! Thanks. Just couldn't think of it! Great video! It's not easy to do that kind of in hand work, and do it well, but it is so helpful. my trainer does it, but in a halter/lead. Same thing though, . . . When the hind end is supple, the jaw can be suppled, and the back can stop being upside down. All are interconnected. Diva (the horse we are talking about) is a 3 day event horse, meaning we do 3 stages (dressage, cross country, show jumping). Show jumping is the only phase that allows bitless in Canada, and sadly takes place outdoors. I show jump her in a double jointed pessoa magic system elevator, and go cross country in a medium shank pelham with a figure eight noseband. Diva sees the chiropractor around monthly, and has had both saddles check by numerous saddle fitters and horse anatomy specialists, and I ride her in an ogilvy half pad as a precaution as I can hit her back not as soft as I’d like. I recently tried the loose rein circle method but we ended up spinning on a ~8m circle for 5 minutes, no relaxation or slowing. Diva has been boarded inside for the past 7 years, and lives in a decent sized paddock during 10-12 hour turn out. For videos and pictures I have an Instagram (@tiana.equestrian) where I’ve posted quite a few videos, not generally showcasing her new btv habit but you can see snippets of it. Sorry for the extremely late clear up, I’ll be answering asap when I can.